While this episode is about cleaning your house, it is also about taking care of some information I need to tell you about an upcoming book. First the vocabulary. Concerning the new book, I needed to get some information from you. First I wrote a post about the book and how that I need input to know where to make the book available. Please comment there or send me an email. Taking care of the house. CLEAN – This is CLEAN as in just something is CLEAN. It is NICE. That is also the sign for NICE. CLEAN. And then you can do WASH like this, or you can do WASH with your open hand. So CLEAN and then WASH or WASH.
And this is the sign for CUP. Something you drink out of. You can WASH the cup CLEAN inside. And then WASH clothes, like a WASHING MACHINE would WASH clothes. You will see some people do WASH clothes like this like you have a washboard and you are scrubbing the clothes. But this would be WASH clothes, or you could do WASH clothes. Either one of those. VACUUM – Like you are pushing the VACUUM cleaner around the room. WASHING PLATES would be anything flat like that. You could WASH the car also. And this is PLATE. This is CUP. Now the reason I wanted to call this one house keeping is because I wanted to talk to you about something besides the signs. So, just some extra things. I am working on a book that should be released next Wednesday, April 17. And I need two things from you. One is I need to know what platform you want the book on. It is going to be an ebook. Because I use the Kindle, then I am certainly planning on releasing it on the Kindle. But what other platforms do you use that you would like me to make the book available at? I can make it for the Kobo, the Nook, other ereaders. But I need to know where you buy your books. You can let me know by sending me an email, . Or you can go to LearnSigns.com/book and there is a blog post that I wrote about the book. And you could just leave a comment there as to where you would like the book to be available. So that is the first thing you can do for me. Is let me know where you would like to have the book. The book is going to be…the first 2 weeks is going to be available for $5. After that I’m going to raise the price to $8. But the first 2 weeks you can get the book and get access to that very—I think—very inexpensively. And it is a book about tips and tricks on how to learn sign language. It is not so much vocabulary. But it is how to learn signs. For example, the lesson we did on fingerspelling. It is all written down in a nice easy form so that you can get the rules for fingerspelling and how to become a better finger speller. And then secondly what I need is I need help designing a cover. My regular designer for things like this is moving right now. So this gives you an opportunity—the LearnSigns community—to participate in the book. And if you would like to be able to help me with that, you can contact me at and I can give you all the specs and we can talk about things. But, of course, I am trying to get it done before the book is due to be released next week. It can be a last minute addition, but it needs to be available before I put the book out there for people to buy. So I would appreciate your help on that. So this is, LearnSigns.com/31 and you can get information about the book at LearnSigns.com/book and I would appreciate any feedback you that you could give me on where you would like the book to be made available. And if any body could help me design a cover, I would appreciate that as well. Of course the book is about learning sign language. However, it isn’t a list of vocabulary and a bunch of pictures. There are many great sign language dictionaries that you can find and use. My book is a book full of tips and tricks on how to learn sign language quickly. Some of the information I have shared here at LearnSigns.com, but some of it is much more advanced than where we currently are with the lessons. Remember the lesson on fingerspelling? Now you can get all the information in one place written in such a way that you can put to practice the exercises I suggest and finally get a handle on spelling well. It should not take more than a couple of weeks to become a better fingerspeller. With the information in the book you will get better if you will learn what I teach. There is a much more detailed explanation on how to notate signs than I was able to give in the video. You will learn the 5 elements of each sign and how to clearly and quickly put them down on paper so that you never have to forget how to do a sign again. There is a large section on reading sign language. This is something we have not covered in the videos at any length, but a skill that you need to begin to master as you learn more vocabulary and begin to carry on real conversations in sign language. Anyone taking sign language lessons from any teacher can benefit from this book. It is not required to be a new student at LearnSigns.com to get value from the content. The information can be used by any student who desires to learn sign language as quickly as possible. You may not even be learning American Sign Language to benefit from this book. In 25 years as a student of sign language, interpreter and teacher of signs, I have traveled extensively and learned several other signed languages. Many of the principles in the book are applicable to other signed languages. 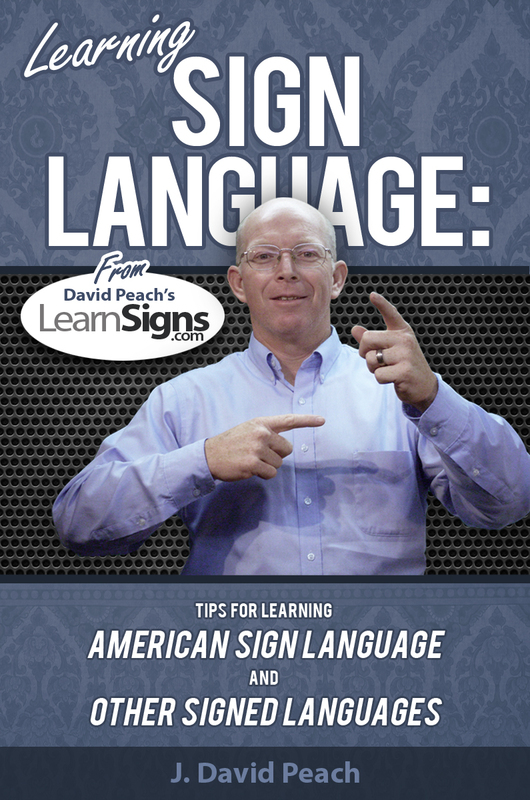 If your interest in signs falls outside of ASL, or you would like to learn another signed language then this book is for you. This book is now available as an ebook that you can read on your Kindle, Nook or Kobo reader. Each one of these can be read right on your computer with appropriate software. Besides the Kindle, Nook and Kobo readers, where else do I need to concentrate my efforts on making a well formatted book for you and your platform of choice? Please leave a comment below or send me an email if you have a prefered store outside of the Kindle/Nook/Kobo stores. Leaving a comment or emailing me will not obligate you to buy the book. I only need to know what your interest is. And, if there is just one person who writes me and asks for a certain format/platform, I will do my best to make it available for you. Don’t hesitate to speak up. Learning to Sign is available for just $5 for the first two weeks. After that the price will be $8. Because of various ebook platforms and their rules, I can’t offer it for a cheaper price in one place than I do everywhere else. Therefore, if you want the cheaper price, I need to know your platform of choice as quickly a possible so I can have it ready for you. After I did the whole video calling these superlatives, I did my homework and found out they are called degrees of comparison. Superlatives and comparatives are the two degrees. Comparatives and superlatives are applied to adverbs and adjectives. We often do this with the words more and most, or with the suffixes -er and -est. Hello Welcome to LearnSigns lesson 28. In this lesson we are going to talk about superlatives. Superlatives are those words like BETTER, BEST. You’ve got your degrees. You have GOOD. And then the next degree up is BETTER. And then BEST. Now, in English sometimes these would be MORE GOOD. I know that we don’t say that. Or, MOST GOOD. We have GOOD, BETTER, BEST. But then some words do use the MORE and MOST. And then some will just use the -ER at the end of the word, or -EST. And so those are the types of words I am talking about here. Superlatives. Now, let’s talk about MORE and MOST first and then we will talk about how to apply this. I am not going to go through all the possible superlatives, because you can use the principles here to build the superlatives that you need. MORE and MOST are the two signs that you would use to get your -ER (your middle one). I forget what that is called. Some grammar person can let me know. And then your -EST. That is your MOST. Your superlative, the BEST one. MOST – There are a couple of different ways to do this. And it depends on how you are using this sign, or what the sign is that you are saying as to which one you use. But most of the time you will use this one. You will have your non-dominant hand, your subordinate hand, is going to stay stationary. And you are going to rub your dominant hand up the knuckles. So your knuckles are going to touch the knuckles. Now, in GOOD, BETTER and BEST, there are … it has it’s own way of doing it. We know that GOOD is like this. And then BETTER is just straight across. BETTER. BEST – And this is, BETTER-EST. BETTER-MOST. Or you could say the MOST BETTER. Of course we would not say that in ENGLISH. You could say that in sign language. But it does have its own sign and that is BEST. So, GOOD, BETTER, and then BEST. Now you can use this MORE and MOST with other signs as well. Let’s look at PRETTY or BEAUTIFUL. We could say BEAUTIFUL. BEAUTIFUL. And then MORE BEAUTIFUL. BEAUTIFUL-ER. MORE BEAUTIFUL is the way you would say it. And then MOST BEAUTIFUL. You do MOST BEAUTIFUL. Now we don’t do that with PRETTY. We do PRETTY, PRETTIER and PRETTIEST. So you could do that as well. PRETTY. PRETTIER – You could do MORE PRETTY or PRETTY MORE. Most of the time you would do MORE PRETTY, PRETTIER. And the MOST PRETTY. PRETTIEST. PRETTIEST. Ok, you see how those are used there? Uh, let’s do to SMELL BAD. To STINK. Oh, it STINKS – STINKS. It is STINKIER. MORE STINKY than before. STINKIER. And then STINKIEST would be MOST STINKY. Oh, the STINKIEST, the WORST. You’ve got SMART. SMART – Remember we did that one? SMART. Now you can do MORE SMART – SMARTER. And then MOST SMART. SMARTEST. TALL, TALL. MORE TALL – TALLER. MOST TALL – TALLEST. OLD. OLD – As in my OLDER brother. You could say, OLDER, MORE OLD, or OLD MORE. MORE OLD or OLD MORE. Either one of those work. And then OLDEST. OLDEST. OLD MOST. Or your can do MOST OLD. Either one of those is fine. So you see how you can apply that to other words. Particularly, I guess adjectives are what you would use these with. And just apply your MORE and your MOST as necessary. So let’s go through those again. And then we have GOOD, BETTER, BEST. WORSE – As in getting WORSE. And then WORST. The WORST it can be. Same way with PRETTY, STINK, STINKIER, STINKIEST. TALL – You could do TALLER. That would be MORE TALL. Or you could do TALL MORE. And then TALLEST. Or MOST TALL. Same way with OLD, OLDER, OLDEST. Ok? So you see how to use those? The superlatives are used with the helping verb…or the helping words MORE and MOST. This is LearnSigns.com lesson 28. If you have any questions you can send me an email at , or you can leave a comment in the comment section below. Thanks for watching. This lesson is about how to give directions. The concept of how to give directions seems to be difficult for many people. Don’t let it discourage you. Remember that the key to giving directions is to give them from your perspective. It is called the signers perspective. Each step should be given as if you were the one going to the location. Consequently, when you are receiving directions from someone remember they are telling you as if they were going to the location. If you are adventurous and want to try your hand at watching a video in signs there is a good video about giving directions in sign language done by a deaf lady. The video is loosely captioned and gives you an idea of what she is saying in sign language. It is well done and explains direction giving with some good examples. Hello! Welcome to LearnSigns.com lesson 27. In the last couple of lessons we’ve talked about prepositions. In this lesson I want to talk about giving directions. And those kind of go hand in hand. Many of the prepositions that you’ve already learned will help you in giving directions. Now there are a couple of other signs that you are going to want to know for giving directions. First of all is going to be your compass points. NORTH, SOUTH, EAST and WEST. Now when you are talking about the compass and giving directions in general, you are going to give it from your perspective. If you are the one giving directions then you talk from your perspective. We call this the signers perspective in directions. So pretend that you are looking at a map. Then the top of the map is NORTH. SOUTH is the bottom of the map. EAST is the right side of the map. And WEST is the left side of the map. When you use the directions like that, NORTH and SOUTH are very simple. Which side is EAST? Which side is WEST? Is it my side? Their side? EAST and WEST, again you should do it from your perspective. So WEST would be to your left and EAST would be to your right. However, that is not as critical. For example, if I said, imagine that you were in Kenya and you wanted to go to the EAST side of the country. Well, I could do EAST side, and that would be the opposite of what I just said: EAST side. But from then on I need to keep EAST one direction and WEST the other direction. The idea that you are saying EAST and WEST should clarify where you mean. So it is not as critical to keep those necessarily straight, but within that conversation it needs to stay consistent on your EAST and WEST. So, NORTH, SOUTH, EAST and WEST. Now you have BESIDE. You can do BESIDE. You are showing the object here and you are set off to a side of it. IN FRONT OF, or AFTER is probably better to say AFTER. And then BEFORE. So I am the signer, I am the one talking about going to the place. You see the tall bank building? Where you are going is AFTER. AFTER the tall bank. Or BEFORE the bank. And this is BESIDE. Now, IN FRONT OF, you can do it this way. IN FRONT OF, you are showing in the PRESENCE of is really the sign there, but it can mean BEFORE (as in IN FRONT OF, not BEFORE as in BEFORE you get to the building). And then you have BEHIND or BACK. The BACKSIDE of something. Or you can do BEHIND like this. You have your stationary object and you are going to go behind it. Or you go PAST it. Go PAST the tall bank building. So those are some other signs that you’ll want to know when you give directions. Now, when you do give directions, let’s say there are two different scenarios. One is that we’re physically in the location that we are talking about. I can tell you to go over there and turn LEFT. That is pretty simple. So if you are in the physical location then look for, really just showing the person with your signs. You have RIGHT and LEFT. You can do both of them with your right hand or both with your left hand. You do LEFT and RIGHT. But again, if I am going to tell you to go out that door over there and turn LEFT it will be from my perspective. Even if you are standing there looking at me in this direction, it’s still going to be to my LEFT as I am giving you directions. So always think about that. Think about it from your perspective. The one that is giving directions. So that, if you were the one walking there and your friend later is going to walk there, then you are giving it from the perspective they would need to know as they walk there, or drive there. Now if you are not physically in the location. For example it is going to be some place downtown. Way over there. Then what you want to do is start with a known location. A common landmark. And ask the person, OK do you know where this store is, or this building is? And then start from there giving your directions. And then you would say, you go up past the tall bank. You know where that is? Go past that. You are going to go past one block, two blocks. So you have side streets here. You are going to go one, two blocks. And you turn RIGHT. Turn RIGHT and go over there. So you can do turn RIGHT like this or your can do it with your classifier, with your car. You turn RIGHT or turn LEFT. And you can also say, go STRAIGHT. Go STRAIGHT. So the big thing about giving directions in sign language—and this seems to be confusing for a lot of people—is that you always giving directions from your perspective. The one that is giving the signs. The one that is giving the directions. It is called signer’s perspective. So give it from the signer’s perspective. And then just use your signs, like the prepositions you have learned in the last couple of lessons. The ones I have given you in this lesson to give a description of how to get somewhere. If you are physically in the location then you show from here how to get there. If you are talking about some location that is distant, then you find a common landmark and then you work from there to get there. If you have any questions, if this doesn’t make sense, or you have other questions then leave a comment on the website: LearnSigns.com and this is lesson 27. So you can go to LearnSigns.com/27 to get to this lesson. Leave a comment there. Or you can write me at and I will be glad to answer any questions I can for you. Thank you for watching.